Supporters of Arkansas' pioneering Medicaid expansion program are relieved that most of Tuesday's Republican state legislative primary contests resulted in victories for pro-expansion candidates. Republican Gov. Asa Hutchinson, who wants to preserve but modify his Democratic predecessor's expansion program, backed candidates in eight GOP primary races and saw six of those candidates win. Led by former Democratic Gov. Mike Beebe, Arkansas expanded Medicaid to low-income adults under the Affordable Care Act in 2014 through an innovative model that placed the new beneficiaries in private health plans sold in the ACA insurance exchange. The state's Medicaid expansion expires at the end of this year unless the Republican-controlled Legislature renews it. Hutchinson, who previously opposed the expansion but now supports a more conservative-friendly version, needs every vote to support his plan, because state law requires 75% approval in both legislative chambers. Conservative advocacy groups led by the Koch brothers-funded Americans for Prosperity are pushing hard to kill the expansion, which has covered more than 200,000 Arkansans. The current lawmakers remain in office until the end of 2016 and will be around to vote on Hutchinson's proposal in the upcoming legislative session starting next month. But Tuesday's primary to pick candidates for November's general election was important for Hutchinson's efforts to win approval for his plan, said Rich Huddleston, executive director of the pro-expansion Arkansas Advocates for Children & Families. “If the elections had gone another way, that could have sent clear signals to the Republicans currently in office who voted for (expansion) that their seat might be up for a big challenge in future years,” Huddleston said. Three of the pivotal races were in the state Senate, where the Medicaid expansion plan previously passed by a single vote. All three candidates favoring Hutchinson's plan won their primary contest. State Sen. Jane English, who initially voted against Beebe's Medicaid expansion plan, subsequently voted twice to reauthorize it. On Tuesday, she appeared headed to a narrow victory over a GOP primary challenger who campaigned to end the expansion. Other victorious Senate candidates who supported keeping the Medicaid expansion were Sen. Eddie Joe Williams and Rep. Lance Eads. In five key House primary races, pro-expansion candidates won three. 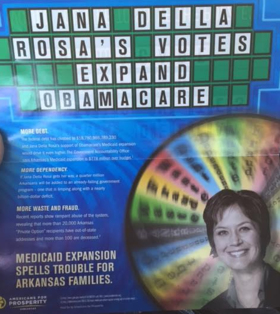 They included Rep. James Sturch, Rep. Rebecca Petty and Rep. Jana Della Rosa, who survived a campaign mailer paid for by Americans for Prosperity saying “Jana Della Rosa's votes expand Obamacare.” One pro-expansion House member who lost Tuesday was Rep. Sue Scott, who had given a powerful speech in favor of Medicaid expansion and came under heavy conservative attack during this campaign for her stance. Hutchinson is seeking Obama administration approval for a modified Medicaid expansion program, which he calls Arkansas Works. He told state lawmakers last month that he got a mixed administration response to the plan, which includes charging beneficiaries premiums and copays and offering employment and job training incentives. Despite the election results, the legislative fate of Hutchinson's Medicaid plan remains uncertain. English and other Republican legislators have said they haven't yet decided whether to support it. But Tuesday's primary outcomes at least kept the plan alive. For those who support Medicaid expansion, “the primary results were generally good and exciting news,” Huddleston said.